The problem with building with desktop CPUs is (at the time I was assembling pieces) the core count / USD was not really that high for any of the desktop processors. Another popular choice for home clouds is the Intel NUCs, but these suffer from the same problem. The NUCs use laptop processors and while reasonably priced you’re still only getting a dual or quad core CPU for a few hundred dollars. Although, the best part about these servers were that I actually had a rack full of basically the same exact servers at the lab in college. The ones I had back in 2010 were a little bit slower and had half the RAM, but were otherwise the same. I configured those servers as a small HPC cluster my last year at college, so I was very familiar with them. Although back then those servers were over 10x the cost as what I was paying for them on eBay now. The only problem with this choice was the hardware, the Xeon E5540 is incredibly slow by today’s standards. But, because of my limited budget speed was something I couldn’t really afford. After waiting a few days the servers were delivered. That was a fun day, the FedEx delivery person didn’t bother to ring the door bell. Instead I heard big thud outside and found that they had left all the boxes in front of my apartment door. Fortunately I was home and heard them throw the boxes on the ground, because it was raining that day. Leaving my “new” servers out in the rain all day would have been less than an ideal way to start the project . It also made quite the commotion and several of my neighbors came out to see what was going on and watched me as I took the boxes inside. My next problem with this was where to put the servers and how to run them. I looked at buying a traditional rack, however they were a bit too pricey. 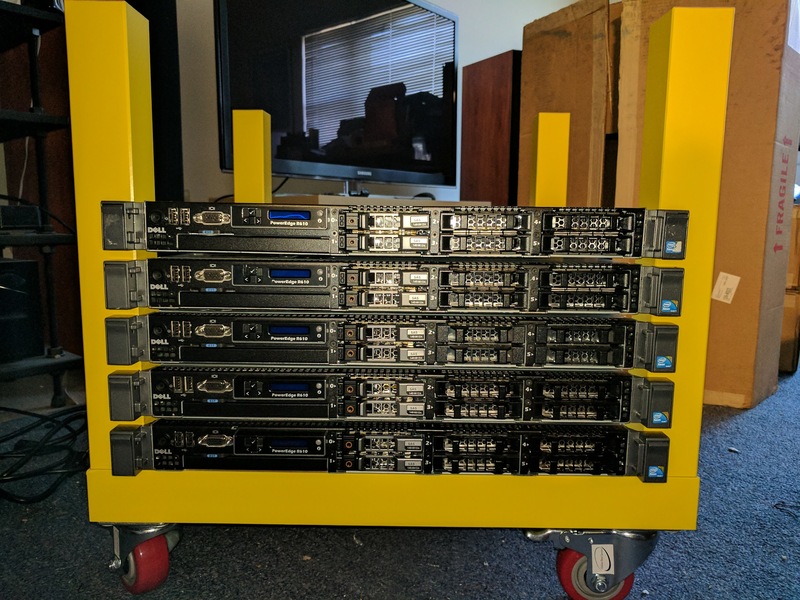 (even on eBay) Just a 10U rack looked like it would cost over $100 USD and after shipping that wouldn’t leave me too much room if I needed something else. So I decided not to go that route. 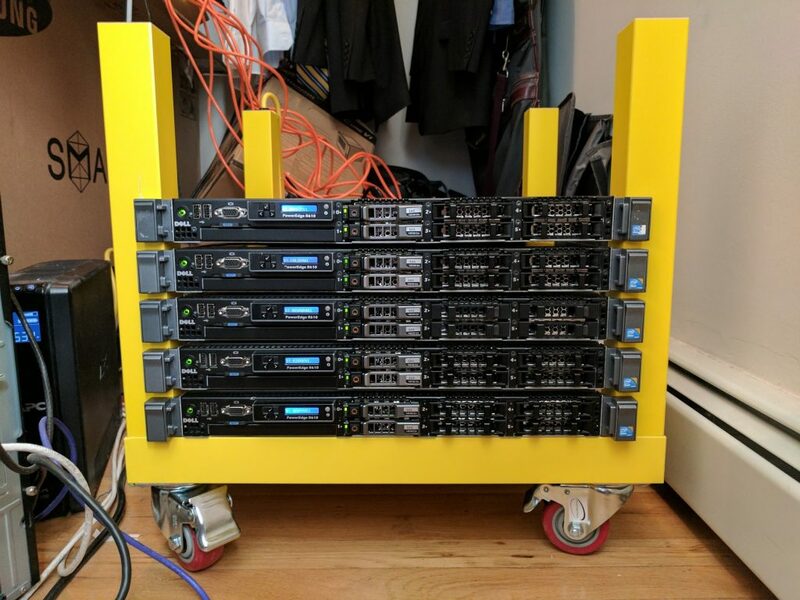 Then I remembered hearing about something called a LackRack a few years ago. It turns out the IKEA Lack table has a 19 inch width between the legs which is the same as a rack. They also only cost $9.99 which made it a much more economical choice compared to a more traditional rack. However, while I could just put the table on the floor and be done with it, I was planning to put the servers in my “data closet” (which is just a colorful term for my bedroom closet where I store servers and clothing) but I didn’t want to deal with having to pick up the “rack” every time I needed to move it. So I decided to get some casters and mount them to the table so I could just push the server around. After getting the working set of hardware the next step was to install the operating system on the servers. As I decided in the original project scope I was planning to follow the official install guide as much as possible. My operating system choice would therefore be dictated by those covered in the guide, the 3 Linux distributions documented were OpenSUSE/SLES, RHEL/CentOS, and Ubuntu. Of those the 3 my personal choice was Ubuntu which I personally find the easiest to deal with out of the choices. Although, looking back on it now if I were to do an install during job college I definitely would of have used RHEL. Georgia Tech had a site license for RHEL and a lot of software we had commercial licenses for only had support on RHEL. But, my preference today between those 3 options is to use Ubuntu. I created a boot usb stick for Ubuntu Server 16.04 and proceeded to do a basic install on each server. (one at a time) The install itself just used the defaults, the only option I made sure was present was the OpenSSH server. This way once I finished the initial install I didn’t have to sit in front of the server to do anything. I would just install any other packages I needed after the install from the comfort of my home office. For the hostname I picked altocumulus because I think clouds should be named after clouds. Although, after I finished the project I got a bunch of better suggestions for the name like closet-cloud or laundry-cloud. It’s worth pointing out that if the servers had come with the management controller installed this step would have been a lot easier. I could have just used that to mount the installer image and ran everything from the virtual console. I wouldn’t have had to sit in front of each server to start the install. But despite this it only took an hour or so to perform the install on all the servers. With the installs complete it was time to start the process of putting OpenStack on each server and creating my cloud. With the operating system installed it’s time to start the process of building the servers out. Given my limited hardware capacity, just 40 physical cores and 160GB of RAM, I decided that I didn’t want to sacrifice 1/5 of that capacity for a dedicated controller node. So I was going to setup the controller as a compute node as well. My goal for this project was to build a compute cloud, so all I was concerned about was installing the set of OpenStack projects required to achieve this. I didn’t have a lot of storage (the 2 149GB disks came configured out of the box with RAID 1 and I never bothered to change that) so providing anything more than ephemeral storage for the VMs wasn’t really an option. OpenStack is a large project with a ton of different projects, (the complete list of official projects can be found here) But, I find some people have trouble figuring out exactly where to get started or for configuration X where to get started. The OpenStack Foundation actually has a page with a bunch of sample service selections by application. The OpenStack Technical Committee also maintains a list of projects needed for the compute starter kit which was exactly what I was looking for. The only potential problem is the discoverability of that information. It kinda feels like a needle in the haystack if you don’t know where to look. It also turns out the install guide is mostly concerned with building a basic compute cloud (it also includes using cinder for block storage, but I just skipped that step) so even if I didn’t know the components I needed I would have been fine just reading the docs The overview section of the docs covers this briefly, but doesn’t go into much detail. With a rough idea of how I was planning to setup the software I started following the install guide on setting up the server. https://docs.openstack.org/ocata/install-guide-ubuntu/environment.html# walks you through setting up all the necessary Operating System level pieces like configuring the networking interfaces and NTP. It also goes over installing and configuring the service prerequisites like MySQL, RabbitMQ, and memcached. For this part I actually found the docs really easy to follow and very useful. Things were explained clearly and mostly it was just copy and paste the commands to set things up. But, I never felt like I was blindly doing anything for the base setup. Install the binary package requirements for the project. This is things like libvirt for nova, or libssl. Basically anything you need to have installed to either build the python packages or to run the service. The problem here is that for most projects this is not documented anywhere. Most of the projects include a bindep.txt which can be used with the bindep project (or just manually read like I did) to show the distro package requirements on several distributions, but few projects use it for this. Instead it’s often just used for just the requirements for setting up a unit (or functional) test environment. I also didn’t find it in any of the developer documentation for the projects. This means you’re probably stuck with trial and error here. When you get to step 6 below it will likely fail with an error that a library header is missing and you’ll need to find the package and install that. Or when you run the service something it’s calling out to is missing and you’ll have errors in the service log until you install that missing dependency and restart the service. Copy the data files from etc/ in the tarball into /etc/$service for the project. The python packaging ecosystem does not provide a way for packages to install anything outside of the python lib/ directories. This means that to install the required configuration files (like policy.json files or api paste.ini files) have to be copied manually from the tarball. If you’re using a different OpenStack release just replace “ocata” at the end of the url with that release name. I wrote down these steps after I did the install mostly based on all of the issues I had during the install process. As you read through the rest of this post most of the issues I encountered could have been completely avoided if I did all of these up front. It’s also worth noting that all of these steps are provided by the distro packages for OpenStack. This is exactly the role that packaging plays for users, and I was just going through the motions here because I decided to use tarballs. Python packages aren’t really designed for use in systems software and have a lot of limitations beyond the basic case of: put my python code in the place where python code lives. If you want more details on this Clark Boylan gave a good talk on this topic at the OpenStack summit in Boston. One thing that isn’t strictly a requirement when installing from source is creating systemd unit files. (or init scripts if you’re lucky enough to have a distro that still supports using SysV init) Creating a systemd unit file for each daemon process you’ll be running is helpful so you don’t have to manually run the command for each daemon. When I built the cloud I created a unit file for each daemon I ran on both the controller as well as all of the compute nodes. This enabled me to configure each service to start automatically on boot, but also encode the command for starting the daemons, so I could treat it like any other service running on the system. This is another thing that distro packages provide for you, but you’ll have to do yourself when building from source. All the other service follow this same format, except for anything running under uwsgi (like keystone, more on that in the next section) , but you can refer to the uwsgi docs for more information on that. This was caused solely because I forgot to use pip constraints at first when I started installing the controller node (I remembered later). Pip doesn’t have a dependency solver and just naively installs packages in the order its told. This causes all sorts of conflicts if 2 packages have the same requirement with different versions. (even if there is overlap and a correct version can be figured out) Using constraints like I recommended before would have avoided this. But after resolving the conflict keystone worked perfectly and I was ready to move on to the next service. 2017-03-29 16:21:52.038 29647 ERROR glance.api.v2.image_data Traceback (most recent call last): 2017-03-29 16:21:52.038 29647 ERROR glance.api.v2.image_data File "/usr/local/lib/python2.7/dist-packages/glance/api/v2/image_data.py", line 116, in upload 2017-03-29 16:21:52.038 29647 ERROR glance.api.v2.image_data image.set_data(data, size) 2017-03-29 16:21:52.038 29647 ERROR glance.api.v2.image_data File "/usr/local/lib/python2.7/dist-packages/glance/domain/proxy.py", line 195, in set_data 2017-03-29 16:21:52.038 29647 ERROR glance.api.v2.image_data self.base.set_data(data, size) 2017-03-29 16:21:52.038 29647 ERROR glance.api.v2.image_data File "/usr/local/lib/python2.7/dist-packages/glance/notifier.py", line 480, in set_data 2017-03-29 16:21:52.038 29647 ERROR glance.api.v2.image_data _send_notification(notify_error, 'image.upload', msg) 2017-03-29 16:21:52.038 29647 ERROR glance.api.v2.image_data File "/usr/local/lib/python2.7/dist-packages/oslo_utils/excutils.py", line 220, in __exit__ 2017-03-29 16:21:52.038 29647 ERROR glance.api.v2.image_data self.force_reraise() 2017-03-29 16:21:52.038 29647 ERROR glance.api.v2.image_data File "/usr/local/lib/python2.7/dist-packages/oslo_utils/excutils.py", line 196, in force_reraise 2017-03-29 16:21:52.038 29647 ERROR glance.api.v2.image_data six.reraise(self.type_, self.value, self.tb) 2017-03-29 16:21:52.038 29647 ERROR glance.api.v2.image_data File "/usr/local/lib/python2.7/dist-packages/glance/notifier.py", line 427, in set_data 2017-03-29 16:21:52.038 29647 ERROR glance.api.v2.image_data self.repo.set_data(data, size) 2017-03-29 16:21:52.038 29647 ERROR glance.api.v2.image_data File "/usr/local/lib/python2.7/dist-packages/glance/api/policy.py", line 192, in set_data 2017-03-29 16:21:52.038 29647 ERROR glance.api.v2.image_data return self.image.set_data(*args, **kwargs) 2017-03-29 16:21:52.038 29647 ERROR glance.api.v2.image_data File "/usr/local/lib/python2.7/dist-packages/glance/quota/__init__.py", line 304, in set_data 2017-03-29 16:21:52.038 29647 ERROR glance.api.v2.image_data self.image.set_data(data, size=size) 2017-03-29 16:21:52.038 29647 ERROR glance.api.v2.image_data File "/usr/local/lib/python2.7/dist-packages/glance/location.py", line 439, in set_data 2017-03-29 16:21:52.038 29647 ERROR glance.api.v2.image_data verifier=verifier) 2017-03-29 16:21:52.038 29647 ERROR glance.api.v2.image_data File "/usr/local/lib/python2.7/dist-packages/glance_store/backend.py", line 453, in add_to_backend 2017-03-29 16:21:52.038 29647 ERROR glance.api.v2.image_data verifier) 2017-03-29 16:21:52.038 29647 ERROR glance.api.v2.image_data File "/usr/local/lib/python2.7/dist-packages/glance_store/backend.py", line 426, in store_add_to_backend 2017-03-29 16:21:52.038 29647 ERROR glance.api.v2.image_data verifier=verifier) 2017-03-29 16:21:52.038 29647 ERROR glance.api.v2.image_data File "/usr/local/lib/python2.7/dist-packages/glance_store/capabilities.py", line 223, in op_checker 2017-03-29 16:21:52.038 29647 ERROR glance.api.v2.image_data raise op_exec_map[op](**kwargs) 2017-03-29 16:21:52.038 29647 ERROR glance.api.v2.image_data StoreAddDisabled: Configuration for store failed. Adding images to this store is disabled. 2017-03-29 16:21:52.038 29647 ERROR glance.api.v2.image_data StoreAddDisabled: Configuration for store failed. Adding images to this store is disabled. I forgot to create the /var/lib/glance dir, so there was no directory to store the images in. Again something else which would have been fix if I followed the steps I outlined in the installing from tarballs section. But after creating the directory everything worked. One thing I do want to note here is that I have small issue with the verification steps for Glance outlined in the install guide. The steps there don’t really go far enough to verify the image uploaded was actually stored properly, just that glance created the image. This was a problem I had later in the installation and I could have caught it earlier if the verification steps instructed you to download the image from glance and compare it to the source image. The next service in the install guide is Nova. Nova was a bit more involved compared to Glance or Keystone, but it has more moving parts so that’s understandable. Just as with the other services refer to the install guide section for Nova for all the step by step details. There are more steps for nova in general so it’s not worth even outlining the high level flow here. One thing you’ll need to be aware of is that Nova includes 2 separate API services that you’ll be running, the Nova API and the Placement API. The Placement API is a recent addition since Newton which is used to provide data for scheduling logic and is a completely self contained service. Just like keystone, the placement API only ships as a wsgi script. But unlike keystone there was no documentation (this has changed, or in progress at least) about the install process and no example config files provided. It’s pretty straightforward to adapt what you used to keystone, but this was another thing I had to figure out on my own. In this instance it was a pretty base requirement, pbr, that was at the wrong version. When I saw this I realized that I forgot to use constraints (because pbr is used by everything in OpenStack) and I quickly reran pip install for nova with the constraints argument to correct this issue. 2017-03-29 18:29:47.844 905 ERROR nova ProcessExecutionError: Unexpected error while running command. The last service I’m installing from the install guide (I skipped cinder because I’m not using block storage) is Neutron. By far this was the most complicated and most difficult service to install and configure. I had the most problems with neutron and networking in general both during the install phase and also later when I was debugging the operation of the cloud. In the case of Neutron I started by reading the install guide section for neutron like the other services, but I also often needed to read the OpenStack Networking Guide to get a better grasp on the underlying concepts the install guide was trying to explain. Especially after getting to the section in the install guide where it asks you to pick between “Provider Networks” or “Self Service Networking”. it made my decision simple. This networking topology was exactly what I wanted. I didn’t want to have to deal with creating a network, subnet, and router in neutron for each tenant to be able to access my guests. With this decision made I went about following the configuration guide lke for the previous services. Unfortunately I hit an issue pretty early on. These were related to Neutron’s default configuration being spread across multiple files. It makes it very confusing to follow the install guide. For example, it says you want to write one set of config options into /etc/neutron/neutron.confthen a second set of config options into /etc/neutron/plugins/ml2/ml2_conf.ini and a third set of config options into /etc/neutron/plugins/ml2/linuxbridge_agent.ini, etc. This process continues for another 2 or 3 config files without any context on how these separate files are used. Then what makes it worse is when you actually go to launch the neutron daemons . 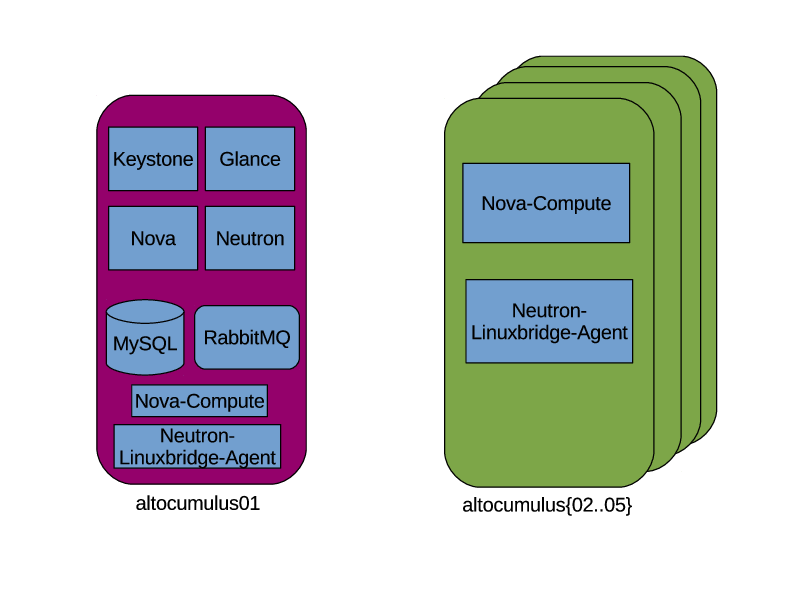 Neutron itself consists of 4-5 different daemons running on the controller and compute nodes. But, there is no documentation anywhere on how all of these different config files are leveraged by the different daemons. For example, when launching linuxbridge-agent daemon which config files are you supposed to pass in? I ended up having to cheat for this and look at the devstack soure code to see how it launched neutron there. After that I realized neutron is just leveraging oslo.config‘s ability to specify multiple config files and have them be concatenated together at runtime. This means that because there are no overlapping options that none of this complexity is required and a single neutron.conf could be used for everything. This is something I think we must change in Neutron, because as things are now are just too confusing. But it also turns out I needed to tell neutron how to call rootwrap. I found this bug on launchpad when I did a google search on my error and it told me about the config options I needed to set in addition to creating the sudoers file. These weren’t in the install documentation as I expect by default the neutron distro packages set these config options. After creating the sudoers file and setting the config flags I was able to get past this issue. Which isn’t helpful at all. It turns out that this error means that neutron can’t find the ipset command, but it’s not at all clear from the traceback. I was only able to figure this out after tracing through the neutron source code (by following the calls in the traceback) I realized that this error is being emitted after neutron calls the rootwrap daemon. I had to turn debug log level on in the separate rootwrap.conf (which is something packaged in the tarball) to get the rootwrap daemon to log the error message it’s encountering, which in this case was that ipset could not be found. After installing ipset this was corrected. After all of these headaches I finally got neutron running. But, I quickly found that my choice for provider networks was causing issues with DHCP on my home network. I only have a single 24 port unmanaged switch at home and the bridge interfaces for the guests were on the same Layer 2 network as the rest of my home infrastructure, including my DHCP server. This meant that when I created a server in the cloud the DHCP request from the guest would go out and be recieved by both the neutron DHCP agent as well as my home DHCP server because being on the same Layer 2 meant they shared a broadcast domain. Luckily neutron’s default security group rules blocked the DHCP response from my home server, but there was still a lease record being created on my home server. Also if I ever loosened the security group rules and DHCP traffic was allowed then there would be a race condition between my server and the neutron agent. It turns out there was a small note (see step 3) on this potential problem in the networking guide. So my solution for this was to disable DHCP in neutron and also stop running the DHCP agent on my cloud. This had a ripple effect in that I couldn’t use the metadata service either because it depends on DHCP to set the route for the hardcoded ip address for the metadata server. (this will come up later) Luckily I was able to leverage the force_config_drive option in Nova to make sure the metadata service wasn’t necessary. If all of the above didn’t make it clear I still find Neutron the roughest part of the user experience for OpenStack. 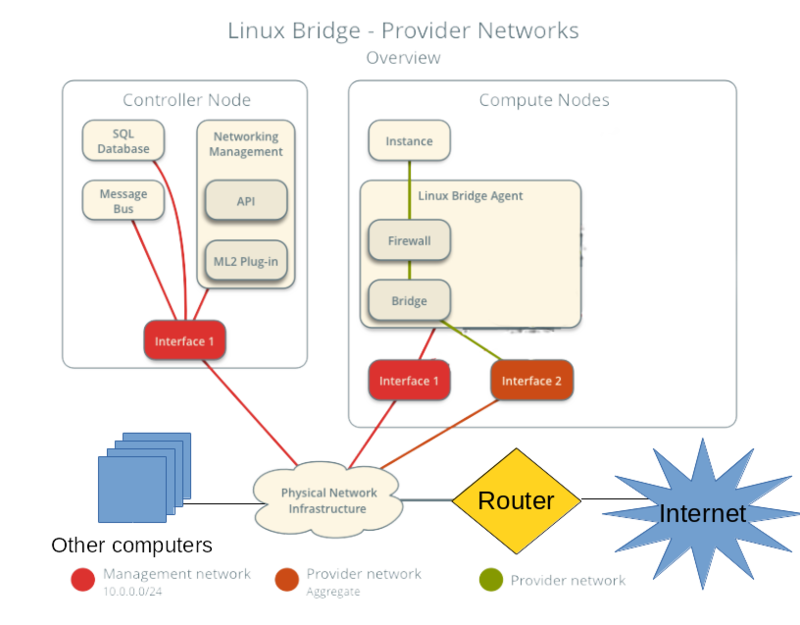 Besides complexity in configuration it also has a presumption of a decent understanding of networking concepts. I fully admit networking is hard, especially for clouds because you’re dealing with a lot of different pieces, but this is somwhere I feel we need to make improvements. Especially in my use case where my requirements were pretty straightforward. I just wanted to have a server come up on my home network when it was booted so I could log into it right after it booted. In my opinion this is what the majority of cloud consumers (people using the API) care about. Just getting an IP address (v4 or v6 it doesn’t really matter) and being able to connect to that from their personal machines. After going through this process I’m pretty sure that my college student self who had a much more limited understanding of networking than I do now would have had a very difficult time figuring this out. Which was the only hint I could find in the glance logs. It wasn’t even that useful all it said was that glance wrote 0 bytes to disk for the uploaded image. Which at least confirmed that glance wasn’t storing any data from the image upload. But, I couldn’t find any other information about this. So I decided to re-upload the image to glance and use tcpdump on both my desktop and the server to make sure the data was getting sent over the wire to glance. The output of the tcpdump showed all the data being sent and received. This at least meant that the data is getting to the glance api server, but it didn’t really help me figure out where the data was going. by hand to the trace the data flow through the glance code to find where the image goes from 13MB to 0 bytes. When I did this I was able to figure out that the image data was being lost outside of the glance code in one of it’s requirement libraries either webob, paste, or something like that. When I saw that I realized that I forgot to use constraints when installing glance. I quickly rushed to reinstall glance from the tarball using the constraints parameter and restarted the service. After doing this and re-uploading the image everything worked! My only mistake in that process was in my over-eagerness to fix the problem I forgot to take notes of exactly what I reinstalled to see where the actual problem was. So all I can say for sure is that make sure you use constraints whenever you install from source, because clearly there was an issue with just using pip install by itself. After getting glance working I was able to re-run the openstack command to create a server and this time I was able to get a console log, but ssh still didn’t work. At this point I had the servers booting, but I wasn’t able to login to them. I’ve personally had to debug this kind of issues many times, so when I saw this my first step was to ping the IP address for the guest, just to rule out that it was an issue with the ssh daemon on the server. Since the ping didn’t work I wanted to see if there were was an entry in my arp table for the ip address. Again, there was nothing on that IP after running the arp command. So this either meant there was an issue with Layer 2 connectivity to the guest from my desktop, or the guest didn’t know it’s IP address. (I’ve personally seen both failure conditions) My next step was to check the console log to see if it was setting an IP address correctly. When I got to the cloud-init section of the console log it showed that the IP address was never getting assigned. Instead the server was timing out waiting for a DHCP lease. If you remember the neutron section above I had to disable DHCP on the guests because it was conflicting with my home’s DHCP server so this clearly wasn’t right. It turns out that cloud-init doesn’t know how to deal with static networking configuration from a config drive. (it might work with a metadata server, but I was not able to check this) So when the guest boots it just ignores the static networking information in the config drive and then tries to get a DHCP lease. This meant that cirros, the recommended image for testing and what the install guide tells you to use, wasn’t going to work. Also the majority of cloud images you can download weren’t going to work either. The only cloud image I was able to get working was the official ubuntu cloud image. This was because Nova was doing file injection to write a the networking information directly into the guest file system. 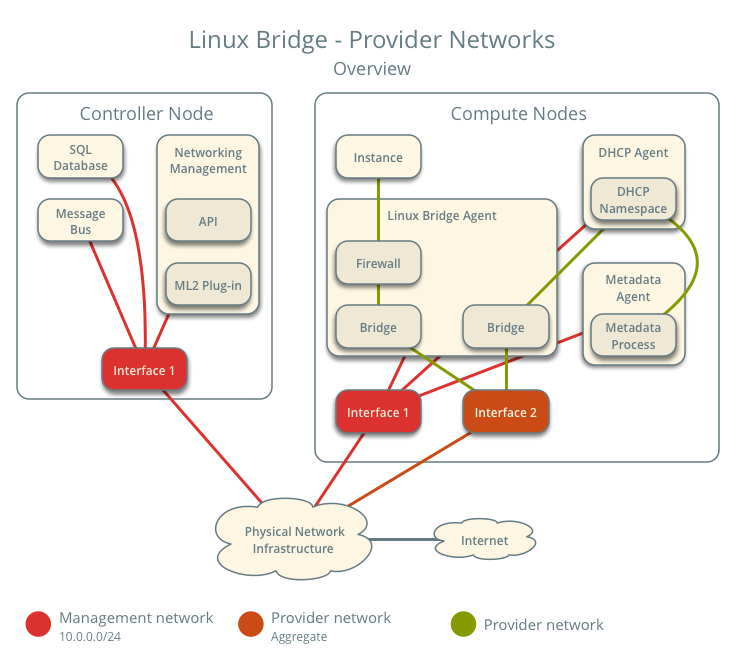 I found a useful blog post on this in my searching: http://blog.oddbit.com/2015/06/26/openstack-networking-without-dhcp/ (although the translation didn’t work on RHEL like that post indicates) But, even if I got ubuntu to work, having a cloud that was only able to boot a single type of image isn’t really that useful. Luckily the OpenStack Infrastructure team has a similar problem on some public OpenStack clouds they run things on, and they created the Glean project to be an alternative for cloud-init that can properly use the static networking information from a config drive. All I had to do was leverage the Disk Image Builder project to create the images I uploaded into my cloud with glean instead of cloud-init. While not ideal solution, because you can’t take anyone’s random pre-existing cloud image, this worked well enough for me because I can remember to do this as the primary user of my cloud. It’s also worth pointing out that all of these networking issues would have been completely avoided if I chose self service networking back in the setting up neutron section. (because it creates a separate Layer 2 network for each tenant) But, given my goals with the cloud and the way the documentation lays out the options I had no way to know this. This connects back to my earlier complaints with neutron being too complex and presuming too much prior knowledge. But, at this point I had a working single node cloud and could successfully boot guests. All that was left before I finished the cloud deployment was to replicate the installation on the remaining 4 servers. This is basically just copying and pasting things across the remaining 4 servers. But there were a couple of lessons I learned from the initial install were reflected in these. The only one I haven’t talked about before was disabling apparmor. (or SELinux on other linux distros) I learned the hard way that the default apparmor rules on Ubuntu prevent nova and libvirt from doing the necessary operations to boot a guest. The proper way to fix this issue (especially for better security) would be to create your own apparmor rules to allow the operations being blocked. But, I have always been confused by this, especially on SELinux and didn’t even bother trying. I just disabled apparmor and moved on. For comparison that rack of similar Dell servers I deployed back in college took me so much longer to get running. In that case I used xCAT for deployment automation. But, it still took me over a month to get the inifiband cards working with RDMA using OFED, setting up SLURM for MPI job scheduling, connecting everything to our central LDAP server, and having users able to launch jobs across all the nodes. While, it’s not entirely a fair comparison since I have almost a decade more of experience now, but I think it helps put into perspective that this is far from the most grueling experience I’ve had installing software. After going through the whole exercise I don’t actually run this cloud 24/7, mostly because it heats up my apartment too much and I can’t sleep at night when it’s running. 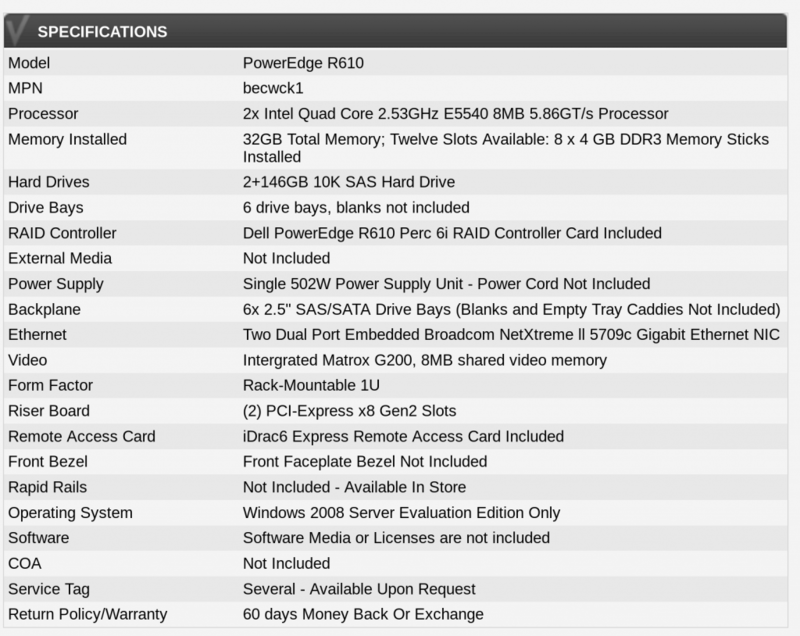 The power consumption for the servers is also pretty high and I don’t really want to pay the power bill. This basically means I failed the second half of the experiment, to virtualize my home infrastructure. Since I can’t rely on the cloud for critical infrastructure if it’s not always running. But I have found some uses for the cloud both for development tasks as well as running some highly parallel CPU tasks across the entire cloud at once. Moving forward I intend to continue working on the cloud and upgrading it to future releases as they occur. Also one of my goals for this entire exercise was going back to the OpenStack community with feedback on how to improve things and submitting patches and/or bugs on fixing some of the issues. This will be an ongoing process as I find time to work on them and also encounter more issues. Granted, if memory serves this support was added somewhat recently so may not be present in the packaged versions you trying to use. Yeah, I saw that in the cloud-init docs too. I’m not exactly sure which versions of cloud-init were on the 2 or 3 different images I tried. But, it definitely didn’t work for any of the images I tried that used cloud-init. I’ll try manually building a couple different images with the latest version of cloud-init to see if that works. I did some follow up investigation, the latest version 0.7.9 of cloud-init works on the fedora 26 cloud base image for OpenStack (found here: https://alt.fedoraproject.org/cloud/ ) However, every other image I tried with an older version didn’t work. Including the latest fedora 25 cloud image which was built with the previous cloud-init version 0.7.8. So I’m gonna conclude that you need the latest version to get it working. Great reading! I think that official OpenStack docs should include such a good explanation for a simple use case. Regarding the provider network and DHCP issue, I’m not sure why did you bring down both of the DHCP servers from your network? Having such a simple use-case, cloud user should be able to take advantage of existing DHCP server, so that new VMs and existing devices can share the same network. I agree being able to leverage my existing DHCP infrastructure would be ideal. But, from my understanding the issue with that is then neutron/nova is not ever made aware of the IP address assigned to the VMs from my external DHCP server. So the API will not have the correct IP address for the VMs. There might be a way to solve this in neutron, but I wasn’t able to find a way reading the docs.